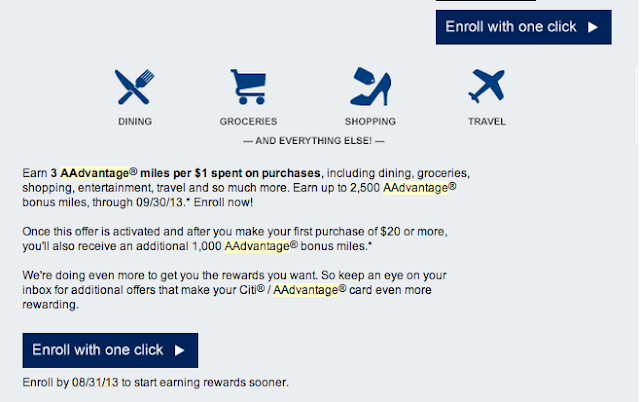 Oren's Money Saver: Citibank - 3x American Airlines Miles - Targeted? Citibank - 3x American Airlines Miles - Targeted? Earn 3 miles for purchases until 9/30 up to 2,500 extra miles. Basically, this means that if you spend $1,250 before 9/30 you will get 3,750 American Airlines Miles. Also, your first purchase of $20 or more will get you another 1,000 miles for a total of 4,750 miles for spending $1,250 or 3.8 miles per dollar spent, not too shabby. I missed the first email they sent me and only noticed the second email so search your inbox if you have a citibank card that earns AA miles. I happen to get 2 miles on up to $750 a month as a retention bonus and I am eager to see if these offers will stack, but I'm not greedy, I'll take 3.8 miles per dollar instead of 4.8.